St. Anthony of Perchersky was born in 983, and is also referred to as St. Anthony of the Caves. He was born in Lyubech in Chernigov, and was baptized with the name Antipas. He was drawn to the spiritual life from an early age, and when he became of age he entered the Greek Orthodox Monastery on Mount Athos to live as a hermit. He was given the job of expanding monasticism in his native Kiev, which was just beginning its conversion to Christianity. St. Anthony returned to Kiev and founded several monasteries on the Greek model on the order of the local Prince. These monasteries were not as austere as Anthony was used to, and his rule was more moderate from the severe austerity that he was used to living in. He chose to live in a small cave that measured 4 yards, and was dug by the presbyter Hilarion. There was a time that a war broke out between the sons of the King, and he returned to Athos for a short time. When he returned to Kiev he became well known in the area for his strict asceticism. He ate rye bread every other day, and drank only a little water daily. He became well know in the area with many seeking his spiritual guidance and blessing. Soon, many people offered to join him. The first to join him was a priest named Nikon, and the second was St. Theodosius of Kiev. Soon thereafter, St. Anthony had gained twelve disciples, and devoted his model to that of a solitary hermit. As his order grew, he would move to another mountain, dig a new cave, and seek a solitary life. Over time the first official Abbott of the Monastery, Barlaam of Kiev, was named as head of the monastery called St. Demetrios, which he built at the gates of the city. As the number of monks grew and crowding became a problem, St. Anthony requested that the King give them the hill in which the caves were located. His request was granted, and the monks built a wooden church and some cells there, surrounded by a wooden fence. Eventually St. Anthony decided to build a larger stone church to accommodate the ever-increasing number of monks. He did not live to see the church completed, and died in 1073. He was ninety years old. Shortly before his death he called the monks together and consoled them about his coming death. He also asked them that his remains be hidden forever. The monks carried out his request, and to this day his remains have not been found. However, many pilgrims come to his cave to pray, and many miracles have been reported. 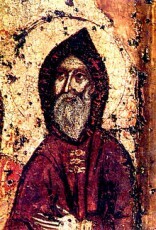 St. Anthony of Perchersky was born in 983, and is also referred to as St. Anthony of the Caves. He was born in Lyubech in Chernigov, and was baptized with the name Antipas. He was drawn to the spiritual life from an early age, and when he became of age, he entered the Greek Orthodox Monastery on Mount Athos to live as a hermit. He was given the job of expanding monasticism in his native Kiev, which was just beginning its conversion to Christianity. He built a monastery, and his efforts resulted in many monks that joined his efforts. He was known as a spiritual director and performed many miracles.